I love the look of rough stones. The stone I used for hers was a rough diamond from Northwest Territories, Canada, which was very suited for her ring considering she lives in Saskatchewan, Canada. 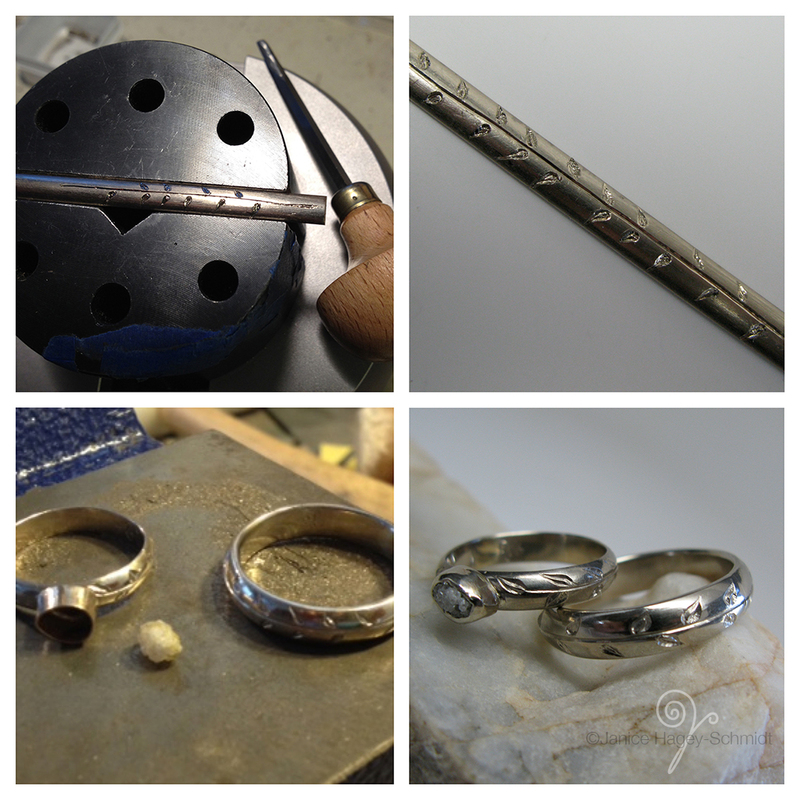 In between working on my sister's rings, I had another challenging and rewarding custom ring project. Using bimetal material of copper and sterling that has two separate melting points, and previously having some issues soldering bimetal, I was a bit nervous with how the fine detail would hold up during the heating process. Luckily hard paste solder and binding wire did the trick. The customer wanted original art –something that had the same feel as her tatoo. So I gathered up some reference material, along with her image she provided and created original art by hand sketching, scanning in and then altering the art in Adobe Illustrator. I was really happy with how it turned out and that there were no meldowns in the studio. I then took a bit of a haitus on custom work after these rings. 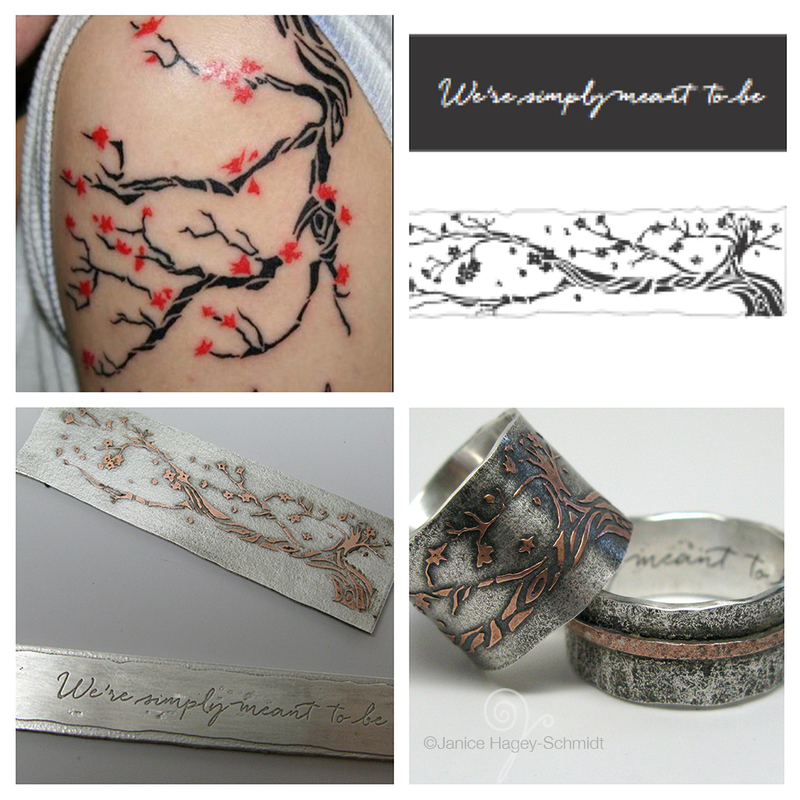 I was busily involved in shows, making regular Etsy items, working a lot on graphic design work and going back and forth to my parent's house to help out. 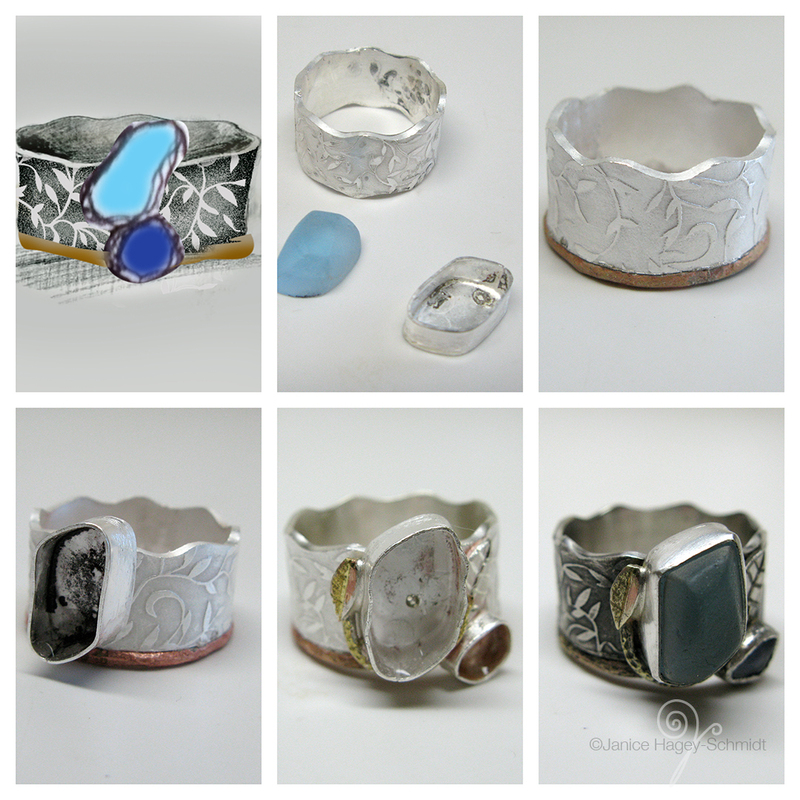 But, by Christmas season, I was commissioned to do a custom ring also with rough stones. This was a lovely project because the customer gave full design reigns to me with some parameters, as she wanted to use the leaf pattern design along with rough topaz and rough sapphire. This was also a fun but nail-biting project, as the topaz that we decided on was much too big. Thankfully, I did have a contact that led me in the right direction to get it cut, because as of right now, I have no idea how to cut a stone. That will be a project for 2016 – Learn how to cut stones! I was so busy during the Holiday season, again, with last minute freelance graphic design work, along with regular orders, that this ring got finished the day before I left to go back to my mom and dad's house! Whew! I was sweating on this one, but it all worked out. I love it, she loves it and I feel like this is really informing where I want to head this year. I would like use more rough cut stones in my work and my goal is to work bigger with some layering. With my water torch, I can only work so big, but it is possible to hinge items together... as in maybe bracelets instead of rings with pattern, typography and rough stones. Looking forward to getting back in the studio at the end of the month for some experimenting.